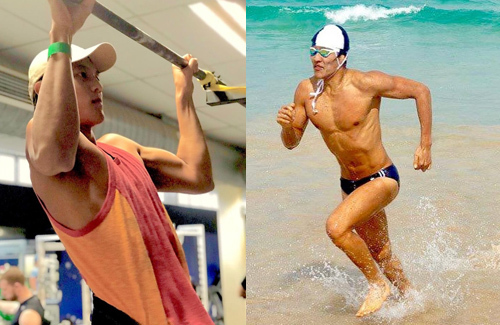 Joe Ma’s (馬德鐘) son Ma Xiang (馬在驤) is not only blessed with good looks and an academic brain, but he is also a fit and talented swimmer who is currently working as a lifesaver in Australia. Studying mechanical engineering at the same time, he is an attractive boyfriend material and seems to be gaining more attention than his father lately. The 20-year-old previously expressed his interest in becoming an actor. Though there were earlier reports of him signing with Shaw Brothers, Joe clarified at an event that the rumor was not true, and his son is still studying. However, Ma Xiang will make appearances at promotional events if the right opportunity crops up. Indeed, with recent photographs of Ma Xing working as a lifesaver in Australia, it appears he really has no intentions of entering the entertainment industry at the moment. But that still didn’t stop the media from taking interest in him. Standing out with his 6-feet-2-inch frame, he imposes a powerful stance. His muscular body was acquired through competitive swimming. It is understandable that Joe is proud of his son, since being a lifesaver at Bondi Beach is certainly no easy feat. This was shown on Australian factual TV program Bondi Rescue that had also aired on TVB Pearl. It revealed the daily hardships of a lifesaver as well as the dangerous situations that lifesavers often have to face. But knowing that Ma Xiang is a multiple gold medalist and talented swimmer, there shouldn’t be much worries. …. these are NOT flattering pics. His face looked scary on thr right. His body is… too-toned (? Can’t find proper term). His muscles look like injection, like padded clothes. If Joe posted though pics to subliminally showoff his sin, he failed for me. Lol. @jjwong Yep, looks too toned to me too. Some women will like that type though. @jimmyszeto lifeguards are usually used for those at the swimming pools. Surf lifesavers are for those working at the beach. I think a surf lifesaver possibly needs more skill than a lifeguard, they need to be able to use the surf board to get to the people and the surfers quickly. I think it’s just a different term to tell you where they work at. Australian beach are quite rough, and we have designated safe swimming zones at the beach, that are being watched by the surf lifesavers. So how many lives did he save this week? @jimmyszeto it’s not just about saving. Australians believe in prevention is better than saving. Sooo a lot of the time, the job of the lifesaver is to remind swimmers and surfer to be within the flag zone (a safe designated swim area that are being watched and patrolled by the lifesavers). Also notify swimmers if there are a bunch of blue bottles appear in the water. Also if he does his job, we’d never know, only if he fails, we know about him. Surf lifesaver is an honorable job, they work in the sun all day and basically don’t get pay that well, while battling the conditions just like fireman and paramedics would (not to the same extent but you know what I mean). 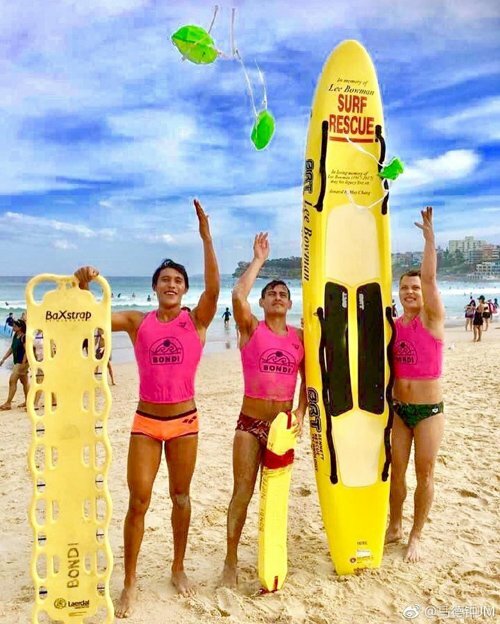 @jimmyszeto surf lifesaver isn’t a job to make a career out of, however, it’s a good start to learn about job and real life, and it’s actually hard of a job to stick to long term. It’s a job that requires loving the beach and the sun lol. And many people start their first job without much think about it, doesn’t mean we should look down on them? Many Australian’s first job is working at maccas lol. Totally agreed. After all, it is only a part-time/temporary job. Xiang Ma should be going to university full time for his Mechanically Engineering degree program. Why should he have so much publicity? woah, i’d be proud too if i have a son with a body like that. nice abs, girls must be all over him at the beach. Not attractive to me either. As a father, of course Joe’s proud of his son. His son appears to have a good head on his shoulders, is doing well in his studies and earning a living by saving lives. He and his wife has done really well in raising their son, he is celebrating his son’s achievements. Good on him!! Attractiveness is very subjective, IMO he has a very toned and healthy body.